In Need Of A Fanuc Repair? Let Repair Zone Help! 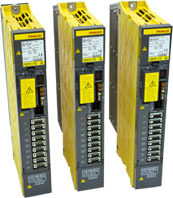 When it comes to repairs, Fanuc servo amplifiers are one of our staples. In fact, a variety of Servo and Spindle Amplifiers come in for repair on a regular basis, from the Alpha, Alpha i, Beta or C series. As a result, our technicians have a great amount of experience and can provide an accurate repair quote for your amplifier. Since they are used in CNC machines, robotics, and other machine applications, we have the ability to help no matter what the application. So, give us the opportunity to repair your Fanuc amplifier today! Repair Zone will get your Fanuc Servo Amplifier back up and running! Or, browse our Fanuc Servo Amplifier Inventory for repair, exchange, or purchase.